‘Fracking’ could soon begin in Ireland after sparking angry protests all over the world. So what’s all the fuss about – and what is it? 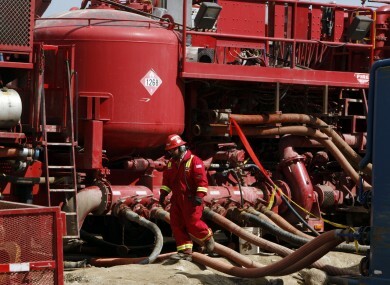 FRACKING HAS BEEN the subject of huge controversy in the US and internationally. It is the subject of a critical documentary, has been banned in France, and campaigners are already warning of the possible environmental consequences if it begins in Ireland. But what exactly is it and why is it such a big deal? Fracking, short for ‘hydraulic fracturing’, is a method of extracting natural gas from pockets in underground rock. It has been used in the oil industry for decades. However, it is only in the last few years that developments in drill technology have made it viable as a technique for tapping gas reserves dispersed through shale rock strata – such as those in Ireland’s Lough Allen basin. Typically, fracking is used when shale rocks contain gas trapped in numerous small pockets. “It’s where you know that there is oil or gas but it can’t get out because those spaces aren’t connected,” explains Prof Shannon. “Fracking opens new fractures in the rock so you can connect those little bits together” and efficiently collect the gas. The chemical gelatinous material and ball bearing-like particles then hold the fracture open, allowing the pressurised water to escape again – along with the gas. Email “Everything you ever needed to know about fracking”. Feedback on “Everything you ever needed to know about fracking”.